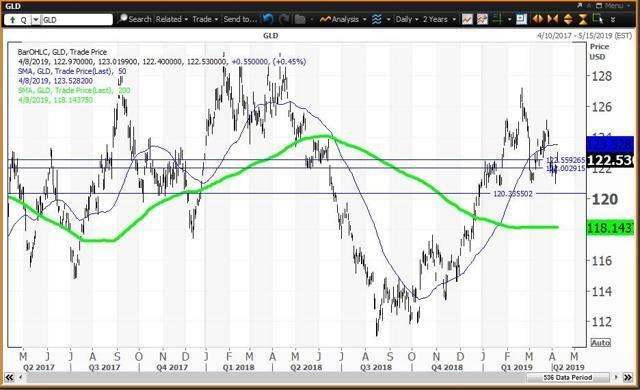 The Gold Shares ETF trades between its semiannual value level at $120.36 and the Feb. 20 high at $127.21. The Commodities ETF trades between its monthly value level at $14.85 and its quarterly risky level at $17.13. The Long Dollar ETF still trades between its annual pivot at $25.47 and its semiannual risky level at $26.39. Here are the daily charts for the gold, commodities and the dollar ETFs. The Gold ETF ($121.98 on April 5) is up 0.6% so far in 2019 and is 9.8% above its Aug. 15 low of $111.06. 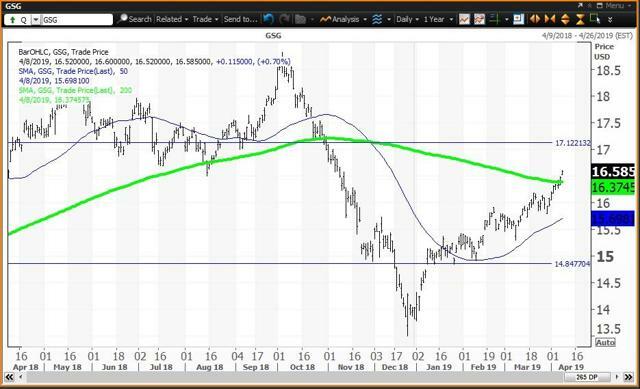 GLD is trading between its 200-day simple moving average at $118.14 and its 50-day simple moving average at $123.53. Investor Strategy: Buy weakness to its semiannual value level at $120.36 and reduce holdings on strength to the Feb. 20 high at $127.21. My annual value level lags at $110.38 with monthly and quarterly pivots at $122.00 and $122.53, respectively. The Commodities ETF ($16.47 on April 5) is up 17.5% so far in 2019 and up 22% since its Dec. 26 low of $13.50, thanks mainly to the strength in Nymex crude oil. This ETF is down 12.4% from its Oct. 3 high of $18.81. GSG is now above its 200-day simple moving average at $16.37, which targets its quarterly risky level at 417.13. Investor Strategy: Buy GSG on weakness to its 200-day SMA at $16.37 and reduce holdings on strength to its quarterly risky level at $17.13. My monthly value level lags at $14.85. The Dollar ETF ($26.06 on April 5) is up 2.4% so far in 2019 and up 12.7% since trading as low as $23.12 in early 2018. UUP is above its 50-day and 200-day simple moving averages at $25.77 and $25.49, respectively. 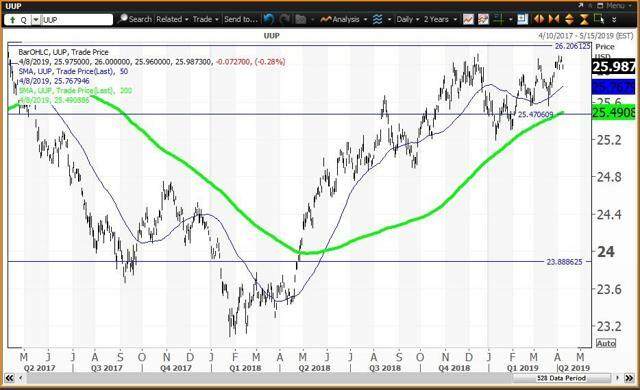 Investor Strategy: Buy weakness to annual and quarterly value levels at $25.47 and $23.89, respectively, and reduce holdings on strength to monthly and semiannual risky levels at $26.29 and $26.39, respectively.